I want to keep safe my eyes when working with my computer. Because now-a-days iam spending most of the day infront of my computer that it continues more than 4 or 5 hours too. If you are a blogger or your work based on with computer, you might facing this problem. It also creates headache, neck pain and shoulder pain.Now i found a way to keep my eyes relax. Yes, i have installed a Eyes Relax program to my computer to manage my time infront of my computer screen. 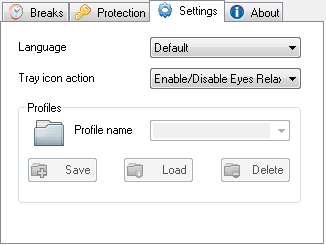 Eyes Relax program is actually an software package that helps you to avoid eye related problems when you are working with your computer continuously. I think this is a useful tool for all king of users including children who are all spending their time to play online games for a long hours. Another good news is the latest version of Eye Relax program 0.74 has released recently. So download and try this tool for your computer. After completing your setup, start Eyes Relax program and set your work time as well as break time. 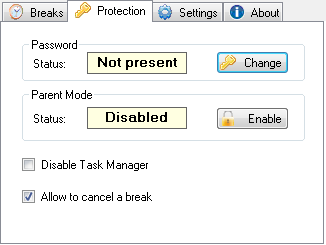 You can lock your computer screen by the use of protection tab. There you should enter the password and enable the parent mode. Porable version of this version also avalable. Click here to download the portable version of Eye relax program. You must have .net framework 2.0 or higher versions installed in your computer to install this application.